Summertime is grilling time, which means it's time to make some BBQ sauce. I know what you're thinking: Why make your own BBQ sauce when there are so many commercial brands to choose from? For starters, it's relatively simple and easily customizable. Once you know the basic ingredients you can tweak them to get the perfect tasting sauce. For example: I prefer more tang to sweet when it comes to BBQ sauce. Another reason I encourage you to make your own sauce is that commercial brands include a high amount of sugar and other questionable ingredients. While I agree you need some sort of sweetener to make a tasty sauce you definitely don't need that much. Making your own allows you to taste as you go and adjust accordingly. So here goes my tried and true BBQ Sauce recipe adapted from Steve Raichlen. It's a thin slightly sweet vinegar based sauce with a nice tang. Combine all ingredients in a nonreactive saucepan and bring to a boil over medium heat. Simmer for 3 minutes. Let cool and correct the seasoning, adding salt, cayenne, or corn syrup; the sauce should be very piquant. (The corn syrup should take the edge off the vinegar, not really make the sauce sweet). Use right away or transfer to jars, cover, cool to room temperature, and refrigerate. The sauce will keep for several months. Shake well before using. 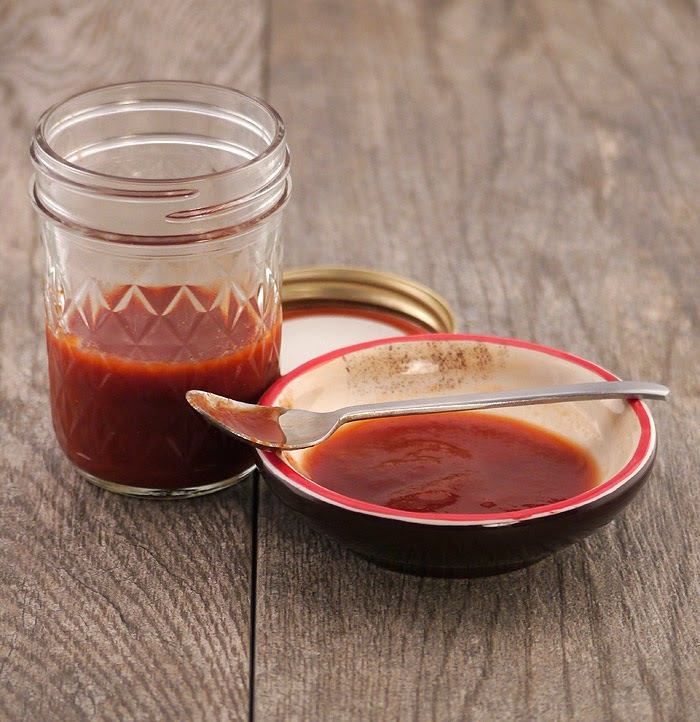 Homemade barbecue sauce is the best! So easy and saves a trip to the store when a craving strikes. Vinegar based sauce is popular here in NC. love this recipe! I love making things like this at home - so easy and it tastes so much better! Now you've gone and made me crave ribs! I never thought of using maple syrup. It looks wonderful! My favorite BBQ sauce is a vinegar based one. You need that bite of the vinegar to compliment the meat. I love making my own barbecue sauce! Even the best store bought ones still tend to be a little to thick and sticky for my liking... yours looks delicious! I love homemade BBQ sauce! It's so much better than the store-bought stuff. Simple BBQ sauces are the best! Pinning this! We like to make our own condiments, too. We sometimes substitute kombucha vinegar for the ACV. It's lovely and probiotic!